Two of my favorite subjects to shoot, Lino and Simone, have come all the way from Italy for the party/book signing at Barneys tonight! elegant suits, Simoneis very charme. I wish you the best tonigh, I hope you have many congratulations . How can I not love SimonEEEE – what style!! Everything i would want to be if I were a man LOL! Oh my…these men are so fabulous. 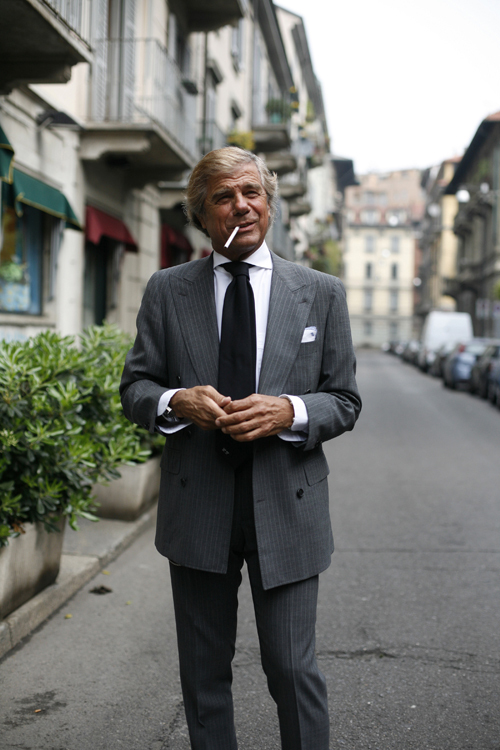 Italian men…sigh. second picture = the epitome of cool. I want to marry #2. I want to look like this now and one fine day. [email protected]#$%#%@#$#@!!!! Why do I have to be away from home right now?????? Thank you for showcasing men looking like men — elegant and tastefully dressed. The fashion-victims of the past several days look silly — particularly in contrast to these gents. By focusing on street fashion, you've brought the power of individual dressing back to the hands of the public. Designers have always looked to street fashion for inspiration but now people are looking at one another for their inspiration. I really love this movement and congratulate you for your great work. You fit right in with the eco-sustainable trend:it's ok for people to mix and match whatever they like.Home sewing is back in style too. I love your site and will buy your book too. so if i leave boston now do you think i can make it in time!!! haha thats awesome , these guys are too cool! okay, I guess I'll take out my chocolate pin-stripe suit again. Too bad about the milquetoast shoes, though. otherwise, beautiful. Why there are a lot of people with cigarettes in your photos? Is it a tribute to Golden Age of Hollywood? Oh, you're not mentioning Milan at all…sigh. Not going? Too booked out? I'll be there Thu., Fri., Sat. of Fashion Week and would love to get my copy signed…. I am so incredibly happy for you! A late congratulations on getting your book. We're really hoping you come to Firenze for a book signing as it would be lovely to see you. Once again congratulations and have fun! First guy looks really elegant. Second guy is ok, but loses major points for the clip on suspenders! are they allowed and admired as these men are good looking or just they are italians or these are just photographs? i was a bit shocked because i am now trying to stop smoking in order to be accepted by others. Too bad the wind spoiled the second shot for use in contrasting the tie widths. Both narrow and wide ties are around right now. imho, a more formally cut suede shoe would work better with the second gent's suit. Simone seems unable to leave the house without looking amazing. I want to see his closet! I am 25 blocks away from your book signing. But, I am scared. Am I stylish enough to approach you? We are all very proud and look forward to showcasing a copy of your book in the store. On personal note – how fun to have Simone and Lino – those two always look great. Many congrats for all your success, Sart. The party must be just breaking up about now & you must let us know if there are writeups on it. These guys have the right attitude to look as good as they do ! Perhaps I am a pinhead because I don't know of these men, but I am just cruising through to get inspiration. I like this look and coloring. Crisp and simple. Wow. Love the suit and certainly the suspenders, but the photo itself is beautifully shot. Absolutely! Why don't I meet men like that? I go to the movies, art galleries, I bathe, wear nice clothes, but I never find men like that in my life. Would they even pay attention to a 54-year-old librarian? great shots, and great well-dressed men! haha thats too cool. good for you, Scott. Sart, I am sad that your first Book Signing was in Paris. Perhaps it is wrong to say but I felt you owed it to New York to debut there. lino looked just as fantastic in person as in pictures. what a wonderful event…thank you for inspiring! Love the beard. Also if you wear something the 'right way' it'd never go "out of fashion"! First guy looks ridiculous. What is right about a strangling collar, too wide lapels and too large a jacket on top of trousers that look too narrow for the jacket. The second guy looks great – he's relaxed in the suit the is right for him. I'd cross the ocean to see Simone. took one look at this and said "that's a cheap suit." to which I answered, " I think he works for a tailor". "Well then, that's the problem with double-breasted, they look better done up." The Clever Pup's husband liked Simone's look but wished he had button-on suspenders not clip-on. He's HOT. I hope I have that much dash when I'm his age. He has a young man's stance and attitude (and body). The years haven't diminished his masculinity or vitality. Bravo, whoever you are. second portrait is awesome, really beautiful, colors, light, composition…. Please have a signing in LA! We would love to have you in Milan, why don't you come here too! I'm waiting to receive your book from the online store and I really can't wait to see it. Congrats!!! Oh my god, yes, I saw him, Lino, and was awestruck. It's him, him from the book! Wow! Haha, it was a great time. You must have more unpublished photos of Simone; please publish/post! The guy is an inspiration and I'd like to see what other tips he can offer visually. Simone looks like a man of the arts who could also wrestle you into a knot if the situation arose whilst still looking like a gentleman. Lino looks like the typical Italian character. Behold, ladies and germs, these gentlemen are showing you how a man should present to the world. hahaha, JPFAN, 4:40PM… you stop smoking for yourself, not to be accepted by others. Your comment encapsulates what is wrong with fashion these days. People tend to dress to be accepted when they should do so to to please the self. WINNER: You’re Coming to the Party!